Serve with sliced bananas or vanilla yogurt, or dusted with powdered sugar. Heat the oven to 350 F. Put flour, sugar, cocoa powder, salt and baking soda directly into an ungreased 9-by-13-inch baking pan. Use a whisk to stir them together. Using a spoon, make 3 separate holes in the dry mixture. Pour the vanilla into one hole. Pour the vinegar into another hole. Pour the oil into the third hole. Microwave the water on high for 3 minutes or until it’s boiling. Pour the boiling water slowly and evenly over the ingredients in the pan. Use the whisk to mix everything together for 2 minutes. No traces of dry ingredients should remain. 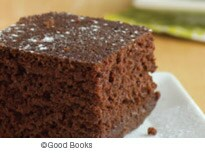 Bake for 25 to 30 minutes or until a toothpick stuck in the center of the cake comes out clean. Let cake cook completely. Cut into 18 squares and serve.